Kayser-Fleischer ring: copper deposition in Descemet’s membrane of the cornea. 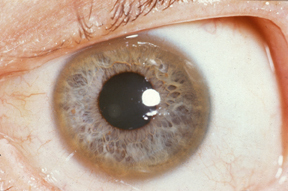 These rings can be either dark brown, golden, or reddish-green, are 1 to 3 mm wide, and appear at the corneal limbus. With rare exceptions, they are diagnostic of inherited hepatolenticular degeneration—Wilson’s disease. This 32-year-old patient complained of longstanding difficulty speaking. He also had a tremor.